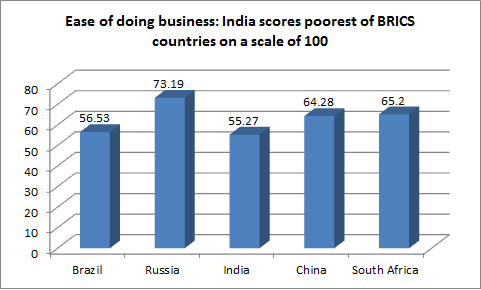 The World Bank has created flutter by ranking India 130th for ease of doing business in its latest flagship report, “Doing Business Comparing Business Regulation for Domestic Firms in 190 Economies 2017”. This is in sharp contrast to the Narendra Modi government’s announcement two years ago to “improve” India’s rankings among the top 50 by 2018. An improvement of just one against the last 2016 report, which saw India jump by 12 ranks, the country’s performance is worst among all the BRICS countries. Brazil, scoring 56.53 on a scale of 100, is ranked 123rd; Russia, scoring 73.19, ranks 40th; India, scoring 55.27, ranks 130th; China, scoring 64.28, ranks 78th; and South Africa, scoring 65.20, ranks 74th. The only consolation for India is, among the immediate neighbours, Pakistan ranks 144 Pakistan with a score of 51.77 and Bangladesh ranks 176 Bangladesh with a score of 40.84. Interestingly, the other two neighbours – Sri Lanka (score 58.79) and Nepal (score 58.88) – rank better than India, 110th and 107th, respectively. “Obtaining such approvals entails a lengthy and difficult process and illegal worker dismissals can result in significant fines and a prison sentence. Industrial establishments also have to observe many other laws that regulate every aspect of their operations from the frequency of wall painting to working hours and employee benefits”, the World Bank states. “High labour costs in formal manufacturing have also contributed to India’s specialization in the production and export of capital-intensive and knowledge-intensive goods despite the country’s comparative advantage in low-skilled, labour-intensive manufacturing”, the reports underlines.